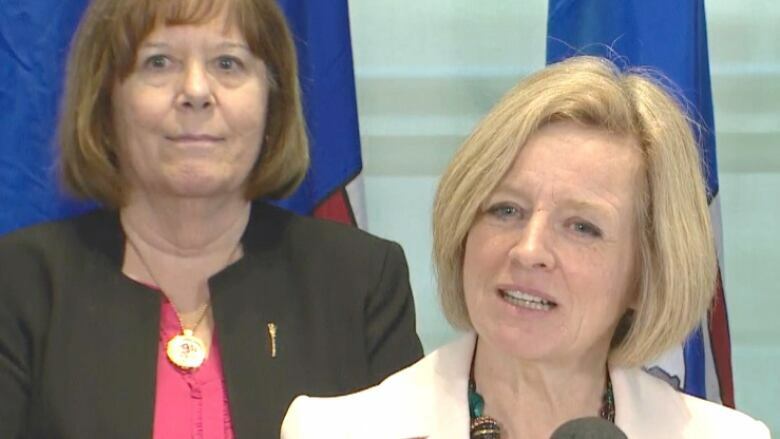 Premier Rachel Notley is tying the start of the Trans Mountain pipeline expansion to future increases of the carbon tax as dictated by the federal government. Premier Rachel Notley is now tying the start of Trans Mountain pipeline expansion to future carbon tax hikes as dictated by the federal government. "Moving forward on additional hikes to the carbon levy will depend on the Trans Mountain pipeline," Notley told the Alberta legislature Thursday, in response to a question from Jason Kenney, leader of the Official Opposition United Conservative Party. Alberta introduced a $20-per-tonne tax on carbon dioxide emissions on Jan. 1, 2017. That increased to $30 a tonne on Jan. 1, 2018. Under the federal plan, the carbon tax must go up to $50 per tonne by 2022. Previously, Notley had said Alberta would respect the federal mandate, but that appears to have changed. The premier has openly expressed her frustration with Prime Minister Justin Trudeau's lacklustre efforts in forcing the government of British Columbia to respect federal jurisdiction over the project. Kenney, on the other hand, has vowed to eliminate the carbon tax if he wins government next year. He introduced a private member's bill on Thursday to have a referendum on the tax. Kenney has expressed skepticism about Notley's tactics, particularly since she already raised the Alberta carbon tax at the beginning of 2018, even though there were no shovels in the ground on the pipeline. Kenney said Notley should suspend the carbon tax to force the prime minister to take action. "If the government here really believes in the carbon tax/social licence argument, then prove it," Kenney said. "Use it as leverage instead of giving it away for free to the Trudeau Liberals. " Notley has become increasingly aggressive in her tactics to force B.C. to allow construction to start on the project that many say is crucial to her prospects for re-election in 2019. The Trans Mountain expansion won federal government approval in 2016. But the B.C. government created uncertainty in January when it called for restrictions on further review of the oil-spill risk. In retaliation, Notley announced Alberta would boycott all B.C. wines. The boycott was later lifted after B.C. decided to refer to the courts the question of whether it can limit bitumen shipments. Notley threatened last week to cut back shipments of oil if B.C. continued to throw up roadblocks to the project. The threat was a central piece of the throne speech, which kicked off the spring session of the Alberta legislature. Federal Natural Resources Minister Jim Carr said in Vancouver earlier Thursday that the federal government is determined to see the pipeline project go ahead.